Male and female athletes have been given an equal number of events in the lucrative 2009 Golden League series. The men's events are the 100m, 400m, 3,000m/5,000m, 110m hurdles and javelin while the women's are the 100m, 400m, 100m hurdles, high jump and pole vault. Any athlete winning their event at all six Golden League meetings will claim at least part of a $1m jackpot. In 2008, the men competed in six events while women could only chase the prize fund in four disciplines. 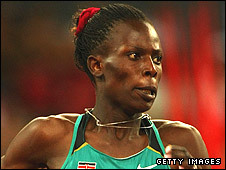 Kenya's Pamela Jelimo claimed the entire pot last year by winning the 800m at all six of the Golden League meetings. If no-one wins all six of their events, athletes with five victories will share $500,000. The 2009 schedule begins in Berlin on 14 June and continues in Oslo (3 July), Rome (10 July), Paris (17 July), Zurich (28 August) and Brussels (4 September).